Andrew Silver is a science writer based in Taipei. Valentine Ananikov, a chemist at the Zelinsky Institute of Organic Chemistry in Moscow, runs chemical reactions so delicate that just a trace of metal nanoparticles, smaller than a bacterium, could change his results. So when his laboratory finishes an experiment, rigorous cleaning is required. Or at least, it used to be. In 2016, Ananikov began creating disposable reaction vessels instead. To do that, he relies on a technology that has captured the imagination of do-it-yourself hackers, engineers and scientists alike: 3D printing. 3D printers have been widely adopted by members of the ‘maker culture’ for education and creating innovative objects. But they are increasingly becoming standard equipment in scientific laboratories, as well. Researchers can use them to replace broken instrument parts, build custom sample holders and model everything from biological molecules to oil-bearing rocks. And clinicians can use them to create implants and teaching models. Objects can be 3D printed using several technologies, but one of the most widespread is fused-filament fabrication (FFF), also called fused-deposition modelling. In FFF printers, a narrow, coloured filament — typically plastic wire — is heated and extruded, forming a shape a layer at a time. By contrast, older stereolithography printers use a tank of liquid light-activated resin that is hardened into precise shapes with a laser. FFF printers tend to produce less detailed objects than stereolithography printers, but are easier and cheaper to use. Commercial FFF printers can be acquired for anything from hundreds to thousands of dollars. Or researchers can build the hardware themselves with kits or designs from the open-source RepRap project for just a few hundred dollars. 3D printing isn’t new: stereolithography printers have existed since the 1980s. But falling prices have made the technology widely available. 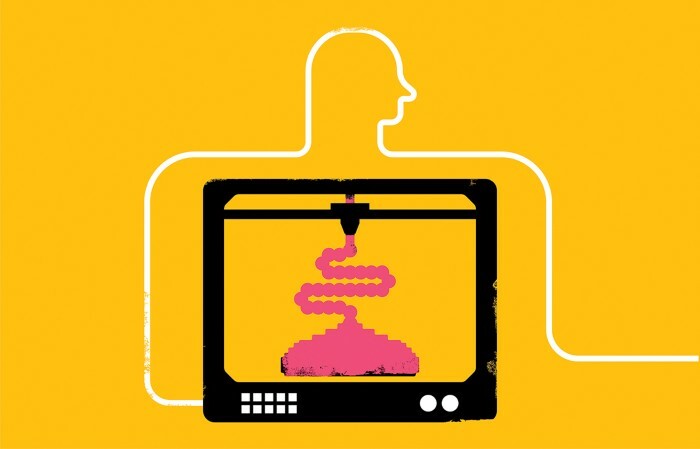 Below are four ways in which researchers have taken advantage of 3D printing. Julian Stirling, a physicist at the University of Bath, UK, is part of a team that designed light microscopes that can be made with 3D-printed plastic components. The idea is to build them in the field in Tanzania and use them to diagnose malaria by searching for parasites in blood. Tanzania has a shortage of knowledgeable mechanics and local components for repairing scientific equipment, he says, and importing components can be expensive and time-consuming. By 3D printing parts, local doctors and scientists can repair their microscopes more quickly and cheaply. A local firm in Tanzania has even created FFF printers from electronic waste and other local materials, he adds. Several websites, including Thingiverse and MyMiniFactory, provide forums for scientists to share computer models of printable components. But in Stirling’s experience, models on these sites are often incomplete, lacking either documentation for a particular project or key files for modifying the designs. As a result, his team creates its builds from scratch, using an open-source programming language called OpenSCAD. Their microscopes can be entirely 3D printed except for the camera, motors and lenses. When it comes to 3D printing, it’s easy to make mistakes, Stirling says. But because the technology is fast and inexpensive, it’s simple to iterate on designs. “This experience can only be built up by trial and error,” he notes. Practice has taught Stirling that there’s a big difference between using a 3D printer in the laboratory and doing so in the field. 3D printing plastic filament in Tanzania’s humid climate is typically harder than in a climate-controlled laboratory because the humidity affects the plastic filament, leading to more failed prints. Furthermore, power cuts are not uncommon, and only some printers can resume printing a half-finished object after power is restored. There’s not much that Stirling and his team can do about the climate, but they do use uninterruptable power supplies to ensure their print jobs run to completion, he says. Ghazi starts with 3D computer-assisted tomography scans of the patient’s tissue, then feeds the data into the commercial medical modelling software Mimics, from Materialise in Leuven, Belgium, and Meshmixer, a free tool from Autodesk in San Rafael, California, to create 3D models. He then prints those models as hollow plastic moulds using an FFF printer, inserts blood-vessel replicas that will connect to a fake-blood pump, and injects the mould with a hydrogel that will solidify into an object with organ-like stiffness. The resulting structures are realistic enough for surgeons to practice their procedures with real-world consequences, including bleeding. Ghazi says that he and his team use these models for up to four surgery cases a week. In each case, they create two copies of the models and pick the most accurate representation. And they’re training other doctors to apply the technology in fields such as heart and liver surgery. “This is definitely something that’s catching on a lot more,” Ghazi says. But imperfections remain. The moulds produced by FFF printers often feature tiny ridges and pits, says Ghazi. Such defects are often too small to see with the naked eye, but are plainly visible to the robotic camera, which could affect the surgeon’s experience. Ghazi’s solution is to spread a layer of room-temperature wax over the inside of the mould, which fills in the ridges and pits, thus smoothing out the final product. “Those little things make a difference,” he says. For Mehdi Ostadhassan, a petroleum engineer at the University of North Dakota in Grand Forks, 3D printing provides a tool for optimizing the extraction of oil and gas from rock. Ostadhassan prints ‘rocks’ using programs such as OpenSCAD and the commercial 3D computer-aided design software AutoCAD (from Autodesk) in combination with various 3D printers and materials. These rock models have realistic physical properties, including tiny, detailed pores, and Ostadhassan puts them under physical stress to better understand how liquid flows through their real-life equivalents. To create the most realistic rocks, Ostadhassan uses a range of printing approaches, including binder-jet technology, in which a liquid binding agent is applied layer by layer to gypsum powder or silica sand. The process produces objects with mechanical properties that closely mimic those of real rocks. But unbound powder can also get stuck in the pores, Ostadhassan says, diminishing the quality of the final product. And for some experiments, he needs to apply a water-repelling treatment to get the ‘wettability’ right. Stereolithography printers are better at printing rocks with detailed pores to enable the study of liquid-flow properties, but the models they produce are not as strong as binder-jet-printed rocks. As such, Ostadhassan is collaborating with other researchers to develop a custom printer that can mimic those pores and cracks but still produce models with the same mechanical strength as real rocks. Today’s 3D printers can output a range of materials — but not all of them. “The material for 3D printing is very, very limited,” says Yang Yang, chief executive of UniMaker in Shenzhen, China, which makes 3D printers for scientific use. But research in the space is intense, and change is coming. One hot growth area is bioprinting, for use in creating structured biological materials. Jin-Ye Wang, a biomedical scientist at Shanghai Jiao Tong University in China, says that her institution has acquired one such device for use in the classroom. These bioprinters blend cells and hydrogels to create structures such as bones and tumour models. Another growth area, Yang says, is metals. Metal-capable printers use a beam of electrons or a laser to melt metal powders in defined patterns. Jeremy Bourhill, a physicist at the University of Western Australia in Perth who researches dark matter, is studying the use of laser-based 3D metal printers to build a mesh of superconducting niobium. This could be used to block strong magnetic fields that would interfere with dark-matter detection, Bourhill says. Using conventional machining to create the mesh would require toxic lubricants and waste a substantial amount of niobium, which is expensive. So Bourhill’s team is using high-powered lasers to melt and fuse cross-sections of metal powder together. But because the melting point of niobium is about 2,500 °C, the process requires considerable amounts of power. “Niobium’s a really tough material,” Bourhill says. Once upon a time, researchers such as Bourhill would have been limited in their options. But with the increased availability of 3D printers, a fundamental shift has occurred, says Yusheng Shi, a materials engineer at the Huazhong University of Science and Technology in Wuhan, China: 3D printing is enabling personalized manufacturing, supplanting centralized manufacturing. As these examples show, researchers have just scratched the surface of what they can do with that power.